This single-player Grab N’ Win game offers more features and is less expensive than imported cranes. 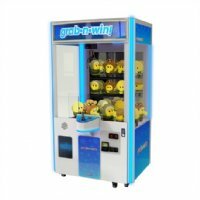 Simply place the crane over the merchandise of your choice and try to grab hold as it makes its way back to the prize door. Can be customized @ the factory to grab Jewelry (additional charge), please see manufacturers website for details.